SOFIA, Bulgaria (BulgarianMilitary.com) – The Bulgarian Ministry of Defence announced that this week, the Bulgarian Chief of Defence General Andrey Botsev participated in the 3rd Counter Violent Extremist Organizations conference, which is organized by the U.S. Department of Defence. 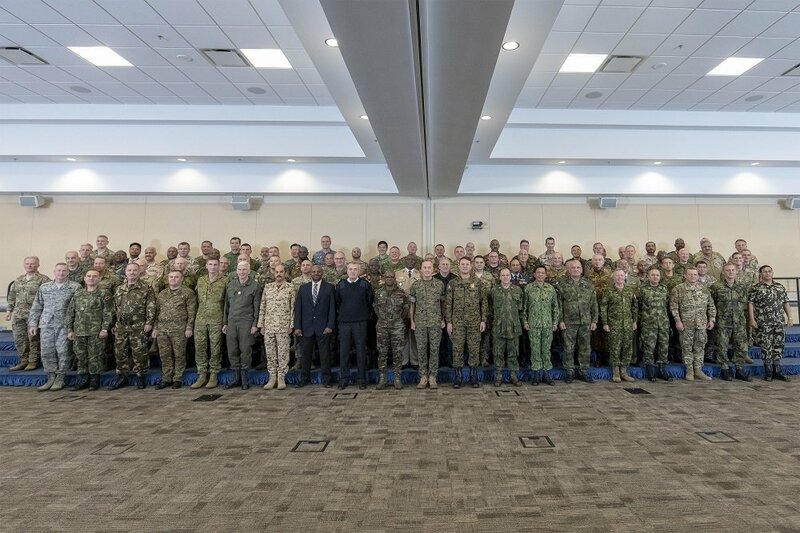 This year’s global conference was held in the period from 15 to 17 October, in the Joint Base Andrews, Washington, learned BulgarianMilitary.com. The chairman of the U.S. Joint Chiefs of Staff, General Joseph Dunford, the host, welcomed in Washington representatives from 83 nations. He expressed that he was pleased with the increasing number of the participating countries, and referred to their number in the past years, when it was 40 in 2016 and 71 in 2017. At the conference, Marine Corps General Joseph Dunford stressed that the violent extremism has became “trans-regional threat” for the security of all countries, which requires to be found politically, financially and militarily solutions. The topics discussed by the chiefs of defence, covered countering violent extremism from West Africa and the Sahel to Libya and the EU maritime operation there, They also talked about the operations in Afghanistan, the fight against ISIS and Al-Qaeda as well as the Sulu Sea and the Southeast Asia challenges. The host greeted the participants for their preparation on the subject. The chiefs of defence agreed that the fight against the trans-regional extremist organizations requires collective action and their network provides opportunities to share information, intelligence and best practices for their benefit. The chairman of the conference General Joseph Dunford pointed out the quantifiable military progress against violent extremism, made during the past two years due to the improved means of exchanging information. During the conference, it was pointed out that over the past three years the number of terrorist attacks and deaths caused by them has been reduced. Despite the results, the participants in the discussion still identify ISIS, Al-Qaeda and their affiliated and associated groups as resistant, firm and adaptable and remain determined in the fight against them. Thus, the chiefs of defence agreed on developing effective measures to reduce the risk of possible using of cyberspace and high-tech means by extremists, in order to improve their communications and logistics capabilities as well the abilities to recruit volunteers and to cause lethal damage. States should pay special attention to the causes leading to radicalization, the participants also stressed.